We wrap up our January filled with digital art inspired by Chicago with a digital oil painting of the legendary Green Mill Cocktail Lounge. This is where your PopCulteer and his wife got to see Alan Gresik and the Swing Shift Orchestra back in December. Video of that show turned up in the most recent video episode of Radio Free Charleston. The mob and jazz history at Chicago’s Green Mill Cocktail Lounge is the stuff of legend, but from the outside, you’d never guess that you can still sit in the same booth once frequented by Al Capone and his gang. Billie Holliday, Al Jolson and Joe E. Lewis were among the performers who frequented The Green Mill back in the early Jazz era. 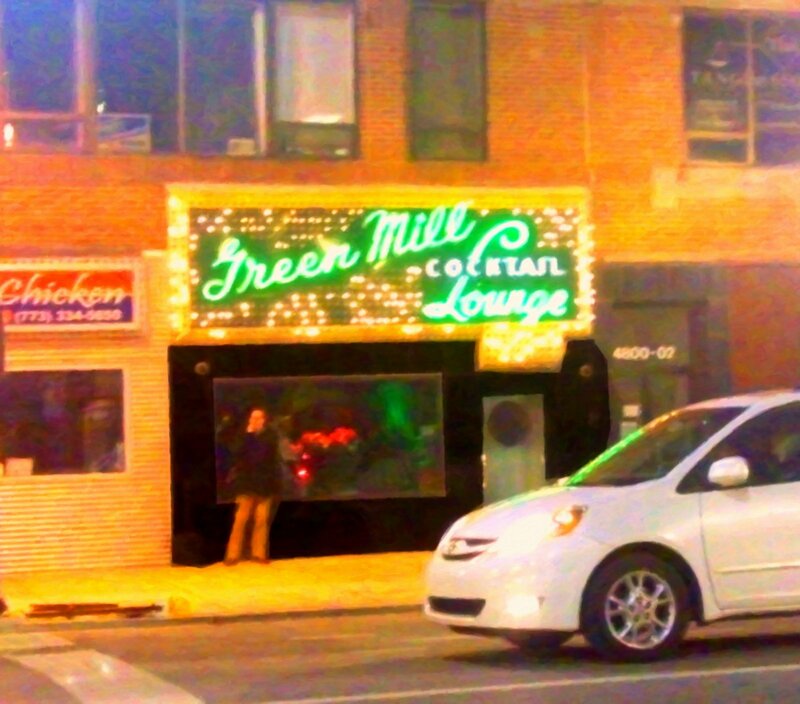 Today, The Green Mill hosts everyone from local Chicago jazz acts to internationally famous artists. Every Thursday you can hear Chicago’s finest Big Band Swing Music there. For this pianting, I took a traditional approach, with some surreal elements in the color and lighting. As always, click the image to see a bigger version. Meanwhile, over on The AIR, The Monday Marathon remains shrunken from 24 hours to 8. It still kicks off at 7 AM, every Monday, and it still showcases one of our popular music programs, but now it wraps up at 3 PM, to make way for two weekly marathon presentations of the best of two of our regular shows. At 3 PM you can settle in for eight hours of great New Wave music with Sydney’s Big Electric Cat. Then at 11 PM you can spend you overnights with eight hours of the best Progressive Rock of the last half-century on Prognosis. Today’s Monday Marathon features Live and Local, with live performances by local performers Matt McGuire, Travis Stephens, Go Van Gogh, Hybrid Soul Project, Christopher Vincet from Qiet, and Corporate Orange.